Clean the Portobello mushrooms and remove both the stems and gills, using a spoon to gently scrape out the insides. Use a frying pan with a lid that is large enough to fit all 4 mushrooms and place it on the stove. Add the olive oil and fry each mushroom for 2 minutes on each side over medium-heat. Don’t fry them for too long, since the mushrooms will be the base where the eggs cook. Crack the eggs, one by one, pouring 1 egg into the concave part of each mushroom. Sprinkle eggs with salt and pepper, to taste. Pour half of the 1/2 cup of water in the bottom of the hot pan and cover. The vapor will cook the eggs and the Portobello mushrooms will turn out as they appear in the photo. If you need more water, add a small amount until the eggs are cooked to your liking. In a separate pot, heat the salsa verde. 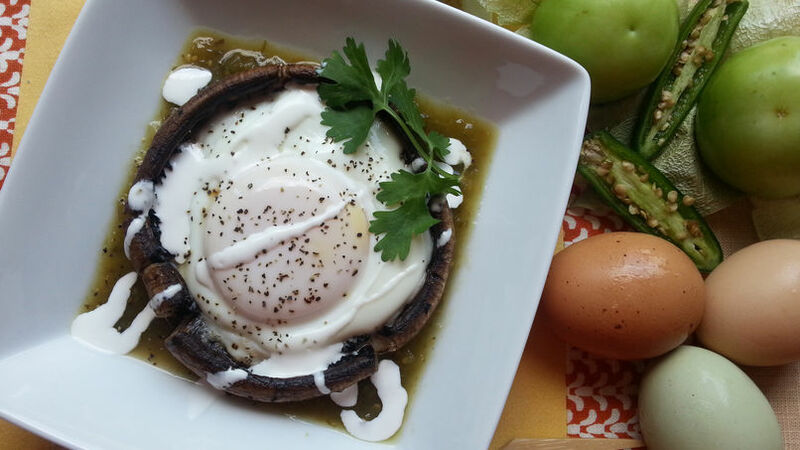 To serve the Portobello eggs, use a bowl and add 2 tablespoons of the hot salsa verde, placing the mush-room with the egg over the sauce. Drizzle with some Mexican cream and garnish with fresh cilantro. Enjoy while hot and fresh. Try using a red, chile de árbol or Mexican sauce with this dish. One of my favorite breakfast recipes is huevos rancheros, which was my inspiration in creating these Portobello eggs to celebrate Hispanic heritage. During the months of September and October we have the opportunity to teach our kids about our traditions, and what better way than through food. Food helps us connect with our homeland, to celebrate where we’ve come from and our beautiful culture. I invite you to prepare this special breakfast and to celebrate Hispanic Heritage with rico dishes. Let’s cook!